Reading cookery books is one of my favorite pastimes these days. I only read and am only interested in books full of color photographs—the more the merrier. This is my way of achieving gastronomic nirvana. I have a reasonably good collection of cookery books—all filled with high quality four-color photographs. My quest for new food items and recipes has taken me to kitchens of all sizes and shapes—from those of roadside shops (thattukadas) to those of five star hotels. I have many gurus, from the thattukada owners to five star chefs, who have taught me many a mouth watering recipe. I learned porotta making (especially the art of stretching and flattening by swirling and slapping it on the table—‘veeshufying’) from a thattukada owner at the Kesavadaspuram junction (Trivandrum). I picked up the intricacies cocktail making from my cousin who was the restaurant manager at Taj Coromandel (Madras). I mastered the finer points of making perfect Spanish omelettes from a chef in Pondicherry. In those days, if I liked a dish, I would leave the house or hotel only after getting the recipe. But now I am compelled to confine my gastronomic experiments and expeditions to the four walls (actually it is three walls) of my study and that is where the cookery books come in. With the books, I can buy the items, prepare them, cook then and eat them all in my mind. Such is the power of visualization, that I am gaining weight with this mental exercise, even though I survive mostly on the air I breathe and water I drink!!! My tryst with cookery books started in 1976, when my mom bought one of the best cookery books. It was The Cookery Year by Reader’s Digest. It was an excellent book and contained a feast of delicious recipes for every month of the year, plus a wealth of culinary advice. I think I was in the 6th standard at that time. My mom used to make many delicious dishes from the book and I was her assistant. Reading the recipes and preparation methods (illustrated with excellent sketches and photographs) was as pleasurable as preparing and consuming them. My tasks were limited to doing the dishes, slicing and dicing the ingredients, transferring the prepared items to serving plates, garnishing, etc. I learned a lot, working as an apprentice in my mom’s kitchen. Since my sister was staying in the hostel, it was my duty to assist my mom in the household chores whenever the housemaid went on leave. My duties involved setting the table, clearing the dishes, cleaning the dining table, doing the dishes after the meals, and so on. Even though, I didn’t have any problem with washing the dishes, it was not something I enjoyed. But I took great pride in cleaning the dishes until they were sparkling. After my accident when we were staying in Madras, we used to get food from hotels. Our main food was pizza as home delivery was available. One day my friend and doctor, after seeing my blood test results, where my cholesterol and TGL were way above the acceptable levels, asked me to cut down on pizzas. He asked me to cook at home. I didn’t have any problem with that, as I was not in a position to cook. But my brother was not very enthusiastic, as cooking and cleaning the dishes were something he loved to hate. So my friend asked us to make a compromise, cook at home every other day. He taught us a dish that could be prepared in 30 minutes and required only one dish—a pressure cooker. It was a simplified version of sambar rice (sambar sadam). But it tasted nice and with a few banana chips it made a complete and balanced meal. The ‘one pot’ cooking is ideal for people who do not want to spend too much time on washing and cleaning. Last month while I was browsing through the Reader’s Digest catalogue, I saw a book titled Just One Pot authored by Reader’s Digest Editors. I have very high regard for the editors at Reader’s Digest as some of the best books I have read are created by them. The list includes excellent books like Cookery Year, How it Works, Reverse Dictionary, The Right Word at the Right Time, 101 Ways to Improve Memory, Baking with Love, Calligraphy Lettering, 2001 Amazing Cleaning Secrets, etc. So I ordered the book immediately and was waiting for it to arrive. As usual the editors at Reader’s Digest didn’t disappoint me. The book is excellent. 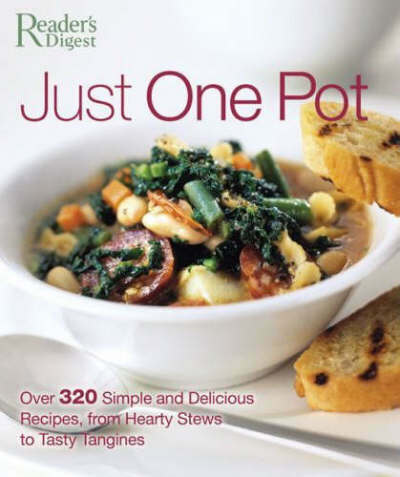 It is full of delicious and healthy ‘one pot recipes’ accompanied with breathtaking photographs. The recipes include tasty and popular favorites like soups and pastas and exotic creations like risottos and tagines. It also includes excellent stir-fries, sautés, stews, curries, vegetable and meat dishes, roasts, polentas, casseroles, and so on. I am including two recipes from the book. Clean and place the chicken pieces in a large dish and season generously with salt and pepper. Rub the seasoning into the chicken. Heat 3 tablespoons of the oil in a large frying pan over medium high heat. Add the chicken pieces in a single layer and sauté until well brown (8–10 minutes). Remove the chicken from the pan and set aside leaving the oil and the cooking juices in the pan. Add the onions, two cloves of the garlic, capsicum and ham. Sauté until the onions are softened (about 5 minutes). Add the rice and broth and bring to a boil stirring often. Return the chicken to the pan. Add the saffron. Mix. Then cover and cook over low heat for 20 minutes. Stir in the mixed vegetables, olives and half the chili. Cover and continue cooking until the rice is tender (about 10 minutes). Stir in the remaining one clove garlic, chili, coriander and parsley. Drizzle with the remaining one tablespoon of oil stirring gently over high heat for 30 seconds. Just warm the oil and herbs. Don’t cook them. They should retain the clean fresh aromas, adding scrumptious ‘lift’ to the final favors of the dish. Soak the noodles in boiling water for 10 minutes for soften. Heat the sesame and olive oils in a wok or large frying pan over medium heat. Add the noodles, baby corn, soy sauce and bean sauce. Stir well until well combined and heated through. Add the bean sprouts, cashew nuts and spring onions. Stir briefly (just 1–2 minutes), otherwise the bean sprouts will wilt and loose the crispness. Serve hot. I hope that the nice folks at Reader’s Digest won’t mind. After all, they are getting free publicity for their book! With more than 100,000/10,000 visitors per week, the book is bound to sell well. A mention here will generate more sales than being selected to Ophrah’s book club! The high traffic on my site has crashed the Statcounter servers several times. So they have told me that they are taking my account off-line until they could upgrade their servers and improve the processing power!!! If you think the above recipes are too easy and mundane for you, then I suggest you head straight to the cook blog of one of the most talented and versatile chefs in the world—Herr Wolfgang Mathew. Don’t be intimidated by the handlebar mustache. He is a jolly good fellow. He is currently serving as the master chef in one of the prestigious organizations in Germany and also training a batch of chefs on the finer points of a special form of culinary art that he has perfected. If you can’t go to Germany, you can learn the art and science of cooking from an equally talented chef—Miss. Anjali—who started cooking at the age of 8 months. But the gurudakshina is one bottle Calmpose tablets and two bottles of strongest liquor available! P.S. I wanted to scan the photographs of the dishes and post it to avenge all the cruel people who have tortured me with their excellent posts, but decided against it out of sheer laziness… But if you want to undergo the torture, pain and experience the hunger pangs, visit the following links at about 12.30AM after making sure that there is no chance of getting any food. Alex , Errr….Would you mind sharing those cookery books for actually eating the stuff on the colour photograph. I can cook for you and may contribute to gastronomic nirvana and an increased weight. Seriously Bol Raha hoon! P S: Think I am the first person to ask but lot of people may follow. Hopefully moi in WL#1. Dont forget Ok.
Would definitely try out the Spanish chicken and impress a few Spanish colleagues!! First thing, even my Stacounter crashes when I put a new post as the hits are high on the first and second day. But after much nagging of Tarak Desai it has been set right. But seriously he seems to be turning out to be stiff competition for Sanjeev Kapoor! Me too! I love reading recipes. And then I think about the distance chance of me trying out a recipe and it coming out like it looks. I love good cooks:-) Though unlike you, I used to run away from any kitchen duties. There is so much good cooking blogs on the web now, I rarely find books inspiring anymore. Mathew’s cooking floored me as well. As I am a vegeterian, I am going to try the quick veg noodle stir fry. Seems yummy ! Being a cancerian, I love cooking and food. I was in Thailand for the past 4 days and the smell of food at their road-side stalls was very tempting but due to language problems I could not muster enough courage to order a veg meal. In any case Thailand is not very veg friendly, though they eat healthy. Mainly sea food, chicken, duck etc., They also eat a lot of fruits which I relished on all 4 days. Thanks for your recipes ! Savoring the dishes while reading about them, and getting physically enhanced with them made a nice concept. kajan: Yes, you are right, there are good cook blogs. But I love the feel of paper and the experience of reading the book is more enjoyable that reading it online. Abhi: Long time no see. Concept is nice but I would love to indulge in those dishes. Learning from the chefs, it is not easy. First you have to befriend them and only then you can ask them to teach you. So it means visiting the same restaurants or shop many times 🙂 Getting the recipes is easier, as most people will give it to if you ask nicely. *whew* good that you mentioned the gurudakshina!! It would be impossible to teach without that!! Being a gourmand who’s now very pressed for time, let me thank you for bringing this resource to my attention. For more than a decade I kept close to my heart this glossy cookbook made by some English lady. The visuals were amazing and the dishes looked and sounded so exotic…. I haven’t drooled that much even when I got my first copy of D.B.Nair! The names of the dishes mentioned have been engraved in my mind and I’ve checked out hundreds of restaurants of four nations to sample them all. Anju: Yes, I understand the difficulty in teaching the guys 🙂 Thank you for tagging. Will do it soon. Anand: Sorry to disappoint you… as a consolation will post some stuff on the stuff 😉 I was sure you would appreciate the time savings. I learned porotta making (especially the art of stretching and flattening by swirling and slapping it on the table—‘veeshufying’) from a thattukada owner at the Kesavadaspuram junction (Trivandrum). Such is the power of visualization, that I am gaining weight with this mental exercise, even though I survive mostly on the air I breathe and water I drink!!! The best experiments I have done are with eggs. Simple, fast and always tasty. i got hungry just reading it..
ure il get the book..
Just stumbled across your site, must say that your recuperation from your accident not just physical but in terms of living life to the fullest is absolutely awe inspiring. I am someone who lives life kingsize, the day I cant do that, I’d put a bullet through my head, so reading through your blogs has been quite inspiring. Kudos to you sir. Best wishes for a bright future. Good luck and god bless.